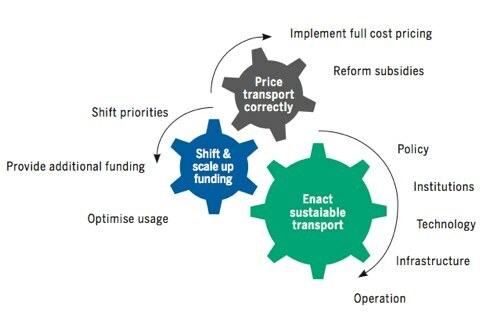 The "cogwheels of change," introduced by transport expert Ko Sakamoto, start with the effective pricing of transport services. “Changes in how transport is financed are essential if cities and nations are to deal effectively with the rapid growth in motor vehicle traffic and related environmental and health problems, including climate change,” according to transportation experts who came together at the Fifth Regional EST Forum, held August 23-25 in Bangkok, Thailand. More than $1.5 trillion is spent annually on transport around the world, says a new report by the Transport Research Laboratory, released Monday by the Institute for Transportation and Development Policy and the Partnership for Sustainable Low Carbon Transport. But much of the money does more harm than good, supporting rapid motorization that contributes to problems like congestion, air pollution, energy insecurity, climate change and traffic accidents, most of which occur in developing countries.The sources of transport financing — public and private financing, development assistance and carbon finance — usually end up paying for things like more roads to accommodate cars, auto-centric development, vehicle manufacturing, subsidies for fossil fuels and other things to support motorization. But it’s not just about what the money buys, but also how it’s being spent: budgets are full of earmarks and hard to reform; there are few safeguards to prevent environmentally harmful development projects; regulations, such as vehicle emissions standards, are not adequate in scale to affect change; etc. What is required to reverse this trend is the “leapfrogging” of the paradigm, whereby developing countries fully use the opportunity to develop their transport systems in a sustainable, low-carbon manner, providing enhanced accessibility and communication without committing to the same level of motorisation seen in the developed world, and in particular North America. A key change will need to take place in how the costs of transport are internalized, as the wider costs to society arising from road accidents, poor health, social impacts and environmental degradation, often described as the ‘external’ costs, are currently excluded from the price that transport users confront. PAY for the full costs of transport including environmental depreciation. This approach is based on the Avoid, Shift and Improve (ASI) approach to climate change mitigation, which aims to AVOID or reduce trips through integrated land use and transportation planning, SHIFT to more sustainable modes of transport, such as walking, cycling or mass transit, and IMPROVE vehicle and fuel technology to make transportation more efficient. The crux of the paradigm shift is making sure people are paying for the true costs of transport services. Under an unsustainable model, the price paid by users for vehicles, fuel, parking and road space do not cover the full external costs to society (i.e. congestion, air pollution, health risks and disease, climate change). Instead, the price of transport should “internalize” its true cost. This can be done through things like congestion pricing, emission zone restrictions and fuel taxes. To learn more about how each stakeholder group — from businesses to schools — can achieve this new transport vision, download the report for full details. Will Los Angeles Revolutionize U.S. Urban Transit Funding?